A former Biddeford man who spent five years in prison for dealing heroin and cocaine has been indicted by the Aroostook County grand jury for more alleged drug crimes. CARIBOU, Maine — A former Biddeford man who spent five years in prison for dealing heroin and cocaine has been indicted by the Aroostook County grand jury for more alleged drug crimes. Aroostook County District Attorney Todd Collins said that the grand jury indicted more than 70 people combined in July and August. Among those indicted, Stafford A. Goodman, 32, who now resides in Presque Isle, was charged with aggravated furnishing of scheduled drugs with a prior charge, possession of scheduled drugs and criminal forfeiture of money, according to the indictment list released Friday. Goodman was arrested on June 21 by Houlton Police Officer Jasmine Cyr after she responded to an incident on North Street in that community. Little more information was immediately available on the recent charges. A judge, however, previously sentenced Goodman to 10 years in prison with all but five years suspended for trafficking in drugs back in 2013. 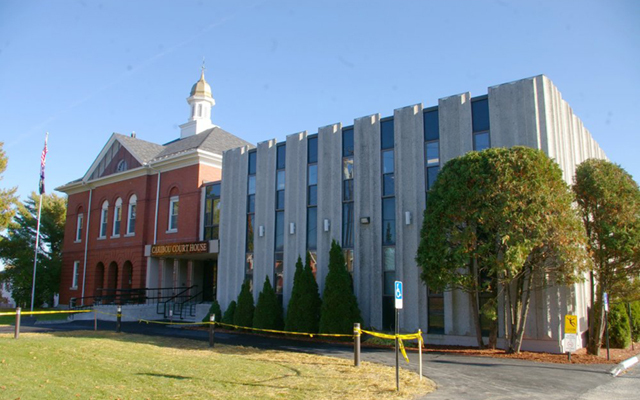 According to the affidavit filed in that case in Rockland District Court by the Maine Drug Enforcement Agency, officers went to a residence in Thomaston as part of their investigation into three people dealing heroin and cocaine. Goodman admitted being a heroin user and while in handcuffs, officers noticed he was reaching his hands down the front of his pants, according to the affidavit. The officers checked and found a bag containing heroin and cocaine, and he later was convicted and sentenced. Karsten C Pedersen, 37, Houlton, domestic violence assault with prior. Branden A. Nason, 24, Houlton, domestic violence assault with prior, assault, criminal mischief. Doris M. Tardy, 42, Blaine, burglary, stealing drugs. Cleveland D. Kenyon, 25, Weston, operating after revocation with priors, violation of bail. Marcy L. St. Peter, 45, Connor, trafficking in prison contraband, aggravated furnishing of scheduled drugs, possession of scheduled drugs. Carroll C. Zetterman, 77, Connor, trafficking in prison contraband, furnishing of scheduled drugs, possession of scheduled drugs. Terry Wilson, 22, Augusta, assault on a corrections officer, assault. Ronald J. Caron, 53, Linneus, receiving stolen property. Matthew R. Flewelling, 29, Bridgewater, operating after revocation (two counts,) failure to give correct name. Isaac G. Flewelling, 24, Houlton, theft with priors, unauthorized use with priors, violation of bail, operating after suspension. Robert L. Garrett Jr, 39, Houlton, assault, tampering with a witness, endangering the welfare of dependent person. Kyle D. Williams, 29, Houlton, theft with priors. Andrew L. Allen, 53, Sherman, burglary, theft with priors, operating after revocation. Clair A. Doody, 33, Woodland, domestic violence assault with priors. Vicky M.LeClerc, 27, Van Buren, theft with priors. Ryan J. Morin, 24, Madawaska, aggravated furnishing of scheduled drug, furnishing alcohol to a minor. Aaron C. Dyer, 35, Presque Isle, unlawful possession of scheduled drugs. Jason E. Ozio, 38, Caribou, possession of a firearm by a prohibited person, reckless conduct with a firearm, criminal mischief. George D. Tamburello, 32, Caribou, unlawful trafficking of scheduled drugs. Brian J. Cyr, 37, Caribou, unlawful trafficking of scheduled drugs. Eric D. Blanchette, 37, St. Agatha, aggravated trafficking in scheduled drugs (three counts,) escape. Trisha L. Carmichael, 43, Fort Fairfield, theft of a firearm, criminal threatening, possession of scheduled drugs. Alan T. Raymond, 26, Chapman, tampering with a witness, violation of bail (two counts,) refusing to submit to arrest. Robert D. Jackson, 51, Castle Hill, aggravated assault, domestic violence assault. Timothy P. Rooney, 35, Easton, burglary (two counts,) theft (four counts). Jessie J. White, 39, Easton, theft (three counts,) eluding, operating after revocation. Darci M. Webber, 33, Easton, theft (three counts). Taylor S. Condon, 26, Ashland, possession of scheduled drugs, possession of a firearm by a prohibited person. Jacob J. Turner, 25, Presque Isle, furnishing scheduled drugs, violation of bail (two counts,) possession of a firearm by a prohibited person, possession of scheduled drugs. Christopher D. Mancos, 38, Presque Isle, domestic violence assault with priors. Landon D. Lovely, 25, Presque Isle, burglary, theft, criminal mischief, operating after suspension. Steven C. Cray, 44, Washburn, operating after revocation, improper plates, violation of bail. Jerry L. Hayes Jr, 46, Presque Isle, aggravated forgery. Angel M. Montes, 31, Presque Isle, domestic violence assault with priors. Lucas Wynn, 31, Presque Isle, theft (three counts,) violation of bail (two counts,) burglary, unlawful trafficking of scheduled drugs. Dustin C. Sutton, 31, Presque Isle, gross sexual assault, (two counts). Matthew D. Sawyer, 35, Perham, eluding, criminal speed, driving to endanger, improper plates. Sean Lee, 32, Fort Fairfield, unauthorized use of property, refusing to submit, eluding, driving to endanger. Jeffrey C. Sock, 28, Presque Isle, aggravated assault, violation of conditions of release. Hope A. Phillips, 38, Presque Isle, domestic violence assault (two counts,) unlawful possession of scheduled drugs, violation of conditions of release. Aaron A. Hilton, 37, Presque Isle, domestic violence assault. Neil C. Gahagan, 35, Presque Isle, burglary, theft, violation of conditions of release. Bayleigh E. Voisine, 28, Presque Isle, possession of a firearm by prohibited person, violation of conditions of release. Jeremiah Therrien, 21, Presque Isle, aggravated assault, burglary, domestic violence terrorizing, violation of conditions of release (three counts,) criminal mischief. Roger L. Simard, Washburn, aggravated assault, domestic violence terrorizing, obstructing report, criminal mischief, criminal restraint, violation of conditions of release, obstruction criminal prosecution. Sabastian Nieves, 19, Fort Fairfield, violation of conditions of release. Noah L. Daigle, 29, St. John, criminal operating under the influence. Ronald Leclair, 68, Fort Kent, unlawful sexual contact. Chelsey J. Webb, 30, Fort Fairfield, theft. Sadie M. Webb, 21, Fort Fairfield, unlawful trafficking drugs, unlawful possession of drugs (three counts), operating under the influence, violation of conditions of release, criminal forfeiture. Larry M. Pinette, 53, Portage, criminal threatening with a weapon, aggravated assault. Randy L. Fulton, 49, Mars Hill, domestic violence assault. Joshua Hartley, 34, Canaan, operating after revocation, violation of conditions release. Kristi L. Morris, 55, Houlton, criminal operating under the influence. Troy R. Stackhouse, 40, Monticello, domestic violence assault, domestic violence terrorizing. Joshua J. Merriam, 30, unlawful possession of scheduled drugs (three counts). Nicholas W. Hall, 35, Presque Isle, unlawful trafficking of scheduled drugs (two counts). Joshua J. Easler, 29, Presque Isle, unlawful trafficking of scheduled drugs. Fernando L. Vasquez, 41, Caribou, aggravated trafficking of scheduled drugs. Christopher Tuttle, 31, Presque Isle, unlawful trafficking scheduled drugs (two counts). Eric A. Frazier, 31, Caribou, unlawful trafficking scheduled drugs. Kurt T. Doody, 23, Woodland, unlawful trafficking scheduled drugs, violation of conditions of release. Autumn Parady, 20, Augusta, unlawful trafficking scheduled drugs. Meagan K. Ouellette, 26, Caribou, burglary, criminal mischief. Branden K. Brewer, 34, Caribou, burglary, aggravated criminal mischief, unauthorized use, operating after suspension. Dwayne L. Wilson Jr., 25, Fitchburg, MA, burglary, aggravated criminal mischief, theft. Mark C. Parks, 30, Caribou, theft.